We use a Holacracy process called a Governance Meeting to quickly evolve the work we identify that needs to be done. It helps everyone contribute to updating work expectations as needs change. Among its many benefits, the system successfully organizes us in a way that acknowledges that job descriptions are out of date as soon as they’re created. The meeting focuses on encouraging and capturing any helpful change that is identified from any contributor. It does that in large part by removing any expectation that any one person can deliver the mythical perfect plan that accurately predicts our future. When we use this meeting, we’re committing to a belief that we are way better at making changes based on our experiences than we are at predicting what’s needed. When introduced to us, it was described as “beautiful.” After some self-work examining and changing some of my own deeply-ingrained beliefs and habits, I agree. The system strips away all the “good ideas” and bluster-style demonstrations of brainpower and theory, focusing instead on refinements based on evidence. It allows us to accurately represent the organization we need and fluidly evolves with change. Theoretical beauty is a far cry from seeing this poetry in practice. Actually letting go of our belief in our ability to predict and control is hard. Proposed changes quite often take the shape of those theoretical improvements we’re endeavouring to get away from. Individuals may also push back (called an Objection) against change for reasons that really aren’t worthy of stopping or modifying the tremendous benefits we get from trying, learning and improving with a quick incremental improvement. 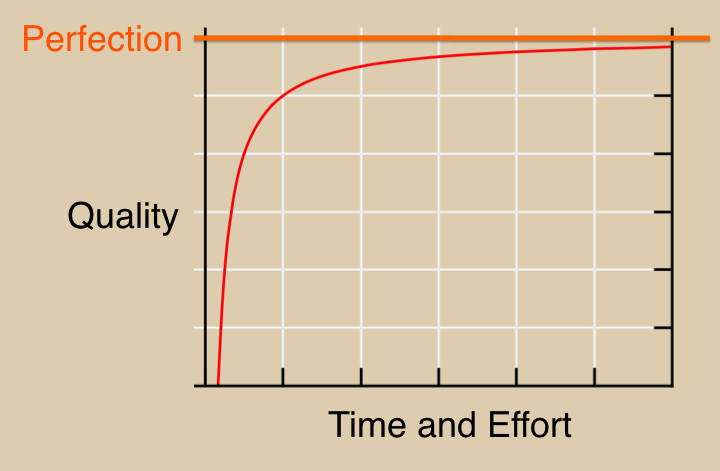 An Asymptote is a mathematical curve that never quite reaches the destination. At some point, it only gets a negligible fraction closer. What does this have to do with you? Advice for being effective in these Governance Meetings is powerful advice for anyone that sees an opportunity for themselves, their team or their organization to get better at taking action. Let’s be honest. Even when the marginal benefit of more conversation has pretty much reached zero, we’re in the habit of delaying action and continuing discussions. Let’s say you buy in. Better yet, let’s say your team buys in. You agree that it actually is more productive to iterate and learn with small adjustments. My first suggestion is for you, as a contributor to finding a solution, is to monitor your own behaviour and make sure you’re not getting hung up on “perfect.” That mostly means not making proposals that are about making things “better” when they aren’t a current problem or when we already have a viable solution that takes us in the right direction. It also means not objecting to changes unless they really, truly, will cause harm that we can’t recover from. Second, give feedback to your colleagues when you see attempts for perfection. We all may agree that “try stuff and evolve quickly” is an important concept for success, but it’s an entirely foreign process. Sharing good ideas isn’t bad. It’s just not as helpful as experimentation. That’s a hard habit to break. Third, as much as you and I don’t like it, patience. My first Governance meeting [my attempt to swallow my better idea] was ugly. So is everyone else’s. As an observer of many of these meetings, I see a dramatic change in how every member contributes when they get a bit of practice. Your feedback can help them observe their actions, but experience is a really good teacher, too. This skill — let’s call it “Prioritizing Experimentation” — is easier to develop if we know and remember why we’re doing it. We create more accurate solutions when we try, learn and iterate than when we try to predict and control. Here’s an easy way to see it in practice. I recommend you watch a video (6:51) about the Marshmallow Challenge. In case you don’t watch it, here’s the takeaway. The best solution designers for this challenge (except for professional builders, thankfully), were kindergarten children. Those children employed the Prioritizing Experimentation skill, not a reliance on Predict and Control. Nevin provides coaching to individuals and businesses to help them accelerate performance, build resiliency and increase happiness. Learn more about how Nevin can help you at www.nevindanielson.com.